The Complete Netflix Guide: History, Top Titles, Tricks & More To Know! With over 140 million subscribers in 20 years, Netflix is a force to be reckoned with. For a large majority of people, Netflix is something that has been in the limelight for just a few years, but little do they know that it is a brand that has been on the market for more than two decades now. Surprising, isn't it? Well, Netflix didn't make its debut as an online Movie Streaming Service back in the year 1997 but as a rental service for movie DVDs that used the internet as a medium for its operation. To get everything covered in this complete Netflix guide, let’s start with the basics and then move on to the other segments related to Netflix such as the future of Netflix, the Netflix subscription pricing and much more. The straightforward answer to this question is that Netflix is an online streaming service that enables its end-users to watch a wide range of visual content which includes movies, TV shows, documentaries etc. 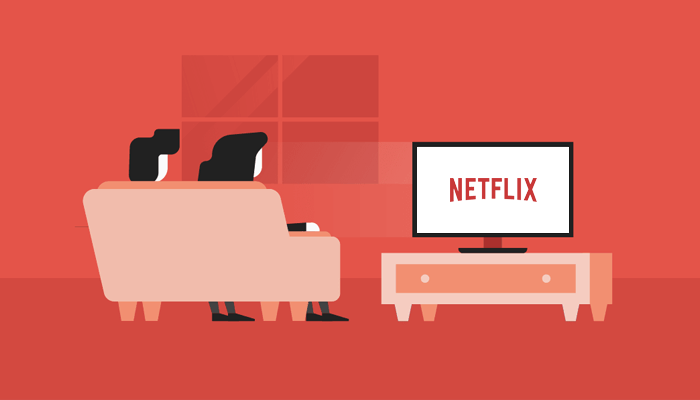 To get a better understanding of the services that were initially provided by Netflix, let’s take a look at the history of Netflix and how it started. Netflix Inc. was founded by Marc Randolph and Reed Hastings in Scotts Valley, California in the year 1997 as a media-services provider. The primary objective of the company was to deliver subscription-based streaming OTT services to its customers, this further included a feature of online streaming of a library consisting of limited TV series and movies. If we look at the latest statistics of this online streaming service, we can easily say that Netflix is currently at the top of their game. For instance, it was reported that as of January 2019 the company had approximately 140 million paid subscriptions globally which included over 58 million paid subscriptions from the USA alone. And the fun part is that these statistics don't include the total percentage of the free trial Netflix subscriptions that are active today that range from 100 million to 150 million in number. The company is a member of the MPAA (Motion Picture Association of America) and now has offices in various locations including South Korea, India, the Netherlands, and Japan. Although the Netflix application is a service that is available almost worldwide there are still some countries where this online streaming service is not available like North Korea, Crimea, China, Syria, and Iran. 1997 - Reed Hastings along with software executive Marc Randolph co-founded Netflix to provide online movie rentals. 1999 - Netflix debuts their subscription service, which offered unlimited DVD rentals with one-month low pricing. 2000 - Netflix introduces a personalized movie recommendation system, which collects their members’ ratings/reviews to accurately predict choices for other members. 2007 - Netflix introduces online streaming, which allowed their users to instantly watch television shows and movies on their personal desktops. 2009 - The company partnered with consumer electronics organizations to stream on the devices including PS3, Internet-connected TVs, and other Internet-connected devices. 2010 - Netflix was available on the Apple iPad, iPhone and iPod Touch, the Nintendo Wii, and other Internet-connected devices. 2014 - Netflix garnered 31 Primetime Emmy nominations including outstanding drama series, comedy series and also documentary or nonfiction special for “House of Cards”, “Orange is the new black”, and “The Square” respectively. 2016 - Netflix launched in 130 countries bringing their global entertainment service to a total of 190 countries across the globe. 2017 - Netflix wins its very first Oscar, with The White Helmets for the Best Documentary Short Subject. 2018 - Netflix wins another Oscar for Best Documentary Feature for Icarus. The average amount of video users watch on Netflix per week is 1 billion hours. Percentage of Netflix users that binge-watch shows is 70 percent. Percentage of Netflix users that share their account credentials is 30 percent. The average number of Netflix viewers per subscriber is 2.5 viewers. The average amount Netflix subscribers pay per hour of content viewed is $0.20. The estimated amount of ads Netflix users avoid by watching it is 160 hours of ads per year. What Is Unique About Netflix? 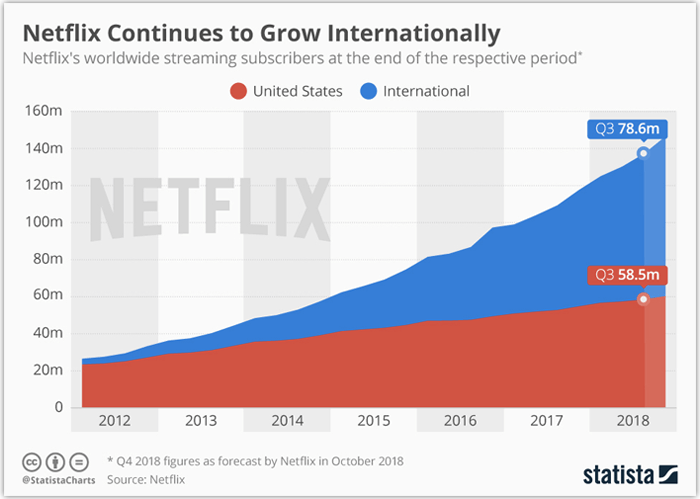 Before we can move to the list of features and functionalities that make Netflix different from its competitors, let’s have a peek at the growth of this organization in the year 2018. In 2018, Netflix went ahead and surpassed the expectations set by Wall Street by gaining a total of 6.96 million subscribers in the span of three months. Apart from this, the company brought the total number of its domestic (US) and international audience for a total of 137.1 million by the end of the third quarter of the previous year. Amazon Prime Video and Hulu are two of the widely-known competitors of Netflix that are constantly integrating new features to beat one of the oldest online streaming services. There’s no denying the fact that Netflix knows how to market its product while keeping up with the changing trends. A great example of this is the whole concept of ‘Netflix and Chill’ which caught the wind in the early 2017 and it is still a trending slang to this date. Also, the company has started to produce its own movies and TV shows under the name of ‘Netflix Originals’. This is a path that is now being followed by the organization’s competitors as well. Users can avail the movie streaming service of Netflix on various types of internet-connected devices and gadgets including Web Browsers, Windows 10, Android as well as iOS supporting devices, Streaming Media Players, Smart TVs, and even Gaming Consoles. Apart from this, the smartphones that we use nowadays can easily support the Netflix iOS and Android mobile apps which can be downloaded directly from the respective app stores. The Netflix Android app has been downloaded more than 500,000,000 and also is also named the ‘Editor’s Choice’. Because of the hardware limitations, all not all smartphones can support the Netflix app i.e. only certain types of Android devices like smartphones and tablets can handle the HD quality. Apart from this, there are some Android phones that can handle 1080p, but the majority of them can only support 720p. To be honest, there’s a lot of content available on Netflix and it is increasing exponentially on a monthly basis. But one thing that can be said for sure about it, the chances of you finding something for your taste are pretty high. In other words, this platform covers nearly every genre you can imagine in one way or another which also helps Netflix in targeting users with different backgrounds, preferences, locations, language etc. It seems like the current focus of the company is to develop more content which includes movies, documentaries and TV shows under the section of Netflix Originals. 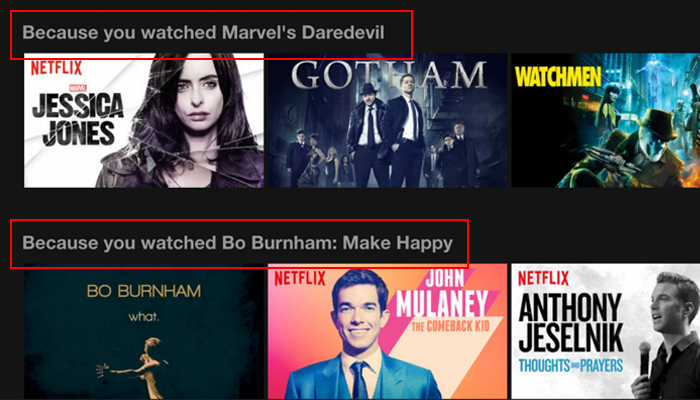 The Netflix Originals shows and movies are now also being widely accepted among the top titles. 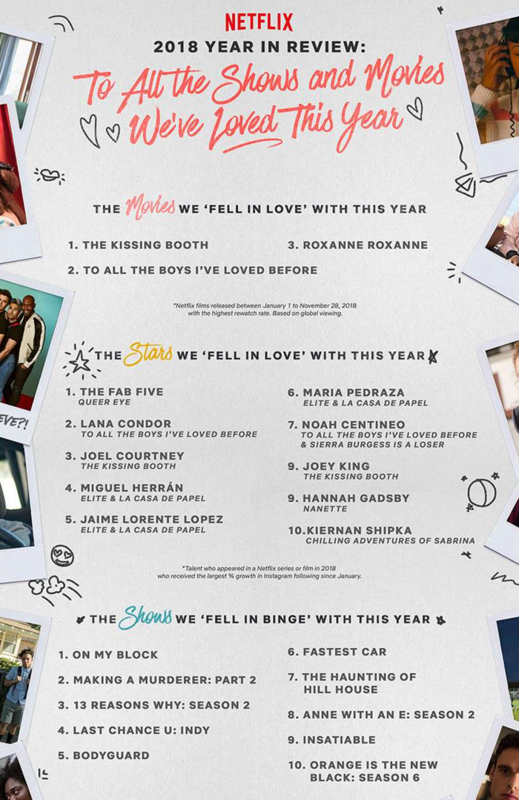 There are various reasons for the success of Netflix Originals and some of them are unique concepts & storylines, amazing cast, relatable content etc. These were some of our picks from the lot, but if you think we missed out on some masterpieces then feel free to suggest them in the comment section down below. Being an online streaming service, one of the things that Netflix tasks pride in is its 'Recommendation Engine' and the fact that it updates its library on a regular basis. In simple words, the more user streams on Netflix, the more Netflix algorithm learns about the taste, behavior, and preference of that user. This information is collected by the system and the user is recommended the TV shows and movies that might be right up their alley. With this in mind, Netflix put efforts into creating a significant queue for the user so that the engagement is maintained. There is a huge chance that the recommendation engine of Netflix is actually something that is helping it in maintaining the lead among the various other online streaming services. To further prove this fact, let's take a look at some basic calculations! The platform of Netflix has 100+ million users that equal to billions of hours of online streaming of movies and TV shows on a monthly basis. This further provides Netflix with direct access to a huge amount of data to judge the viewing preferences and patterns of its user base. These were the three-tiered subscription plans that you need to choose from so that you can make the most of 'what to watch on Netflix' that we have stated above. We can also say that the only major differences between the Netflix pricing and subscription plans are the streaming quality & number of devices allowed for simultaneous streams on Netflix. There are some questions that do not have a straight yes or no as an answer and this is one of them. Netflix is not exactly safe for kids but it can be made child-friendly by making some extra efforts. 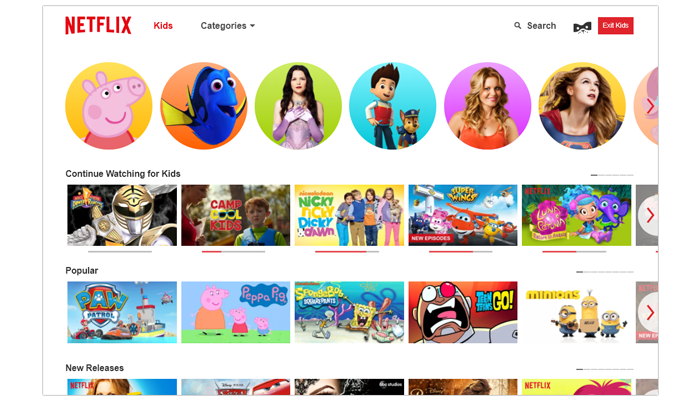 To activate the kid-friendly portal just go to netflix.com/kids and you will be taken to a platform where the content is specially curated for toddlers, preteens, and even adolescents. The next option is enabling the parental controls to keep your children safe from all the mature content that this online streaming service is offering on their platform. 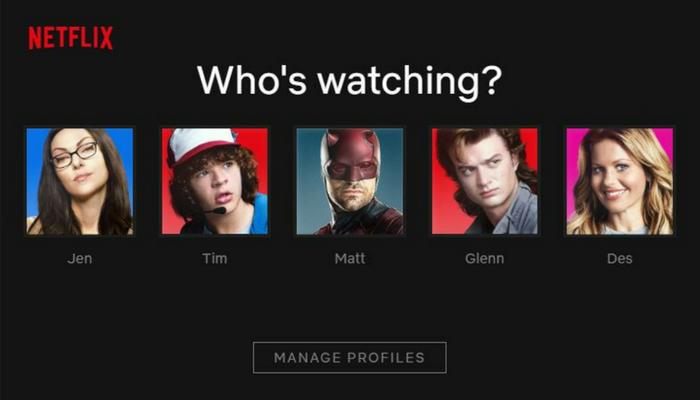 All you need to do is make a separate profile for their kids and set a Maturity Level on the profile created which will restrict their options on Netflix. Users can customize the subtitles of all the Netflix movies and shows that have subtitles in other languages like English, French etc. So, don't worry if the subtitles look a bit odd to you as you can easily change them. You can stream Netflix shows and movies with your friends even if they are not in the same room as you. But this is not an in-built feature so you need to use third-party applications for this purpose. On Netflix, every user can make up to five profiles per account, in addition to this, every profile can further have their own watchlist, custom suggestions, review/rating options etc. Many people like to rewatch their favorite Netflix show or movie from time to time but now they can easily download it instead of streaming it online. In iOS, Windows and Android applications, users have the option to download their favorite content and watch it when they do not have any access to the internet. Another Netflix tip is that you can directly adjust your playback preferences instead of going for the default option where Netflix auto-adjusts the video-quality of your online stream on the basis of your internet speed. If you are someone who has no clue about what to watch on Netflix, there you should definitely head over to the subreddit r/NetflixBestOf that provides constant updates on Netflix watchlist. Now you have the option to avoid spoilers, all thanks to Netflix Socks. These high-tech socks have an inbuilt pulse sensor that automatically pauses the show when it senses you have fallen asleep. Also, you can DIY your own Netflix socks and here’s a whole tutorial over it. By using the Netflix Enhancement Suite, users can also add reviews and ratings on the Netflix movies & TV shows they are watching like rotten tomatoes ratings, IMBD links etc. As discussed above, Netflix is currently flying high and as per the reported statistics, it seems like 2019 will turn out to be a great year for this online movie streaming service. The future of Netflix is promising, especially if we look at the different Netflix Originals projects that are scheduled at present. A majority of people have even claimed that Netflix is 'cutting' the cable TV cord worldwide by offering more quality services than the cable TV subscription services and that too at a much lower price. Stable, secure & fast internet connection is a must. Slow internet will make the video quality suffer. Live shows are not an option for now. 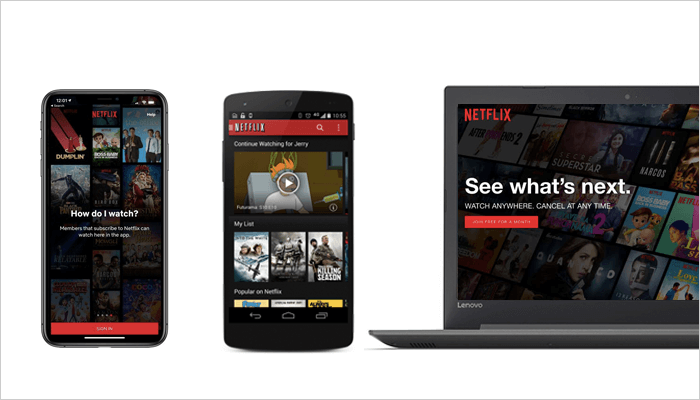 Hundreds of GBs are consumed by Netflix on a monthly basis. Apart from this, there are also some major things that are missing from the platform of Netflix such as sports or news feeds. 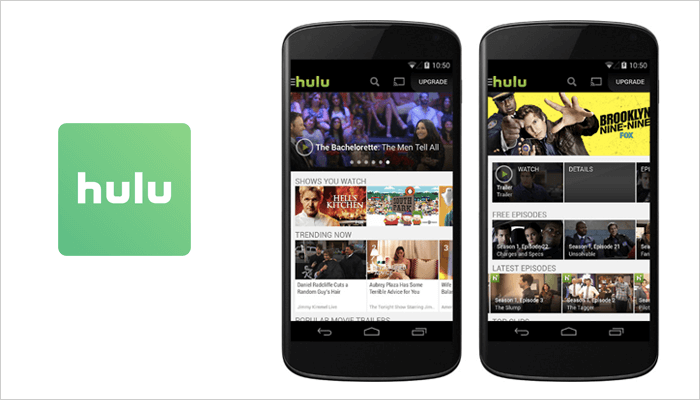 Hulu is basically a subscription service that provides video-on-demand services to its end-users. As it is a joint venture between various entertainment giants such as Walt Disney, 21st Century Fox, Time Warner etc. the company is further segmented into free service options. This free service option was limited in terms of streaming content while providing the option of paid service on the other hand with a much wider variety of content to select from. We can also say that if you want to stay up-to-date with the all-new TV shows then instead of investing in a cable TV, you can directly opt for this online video streaming service. 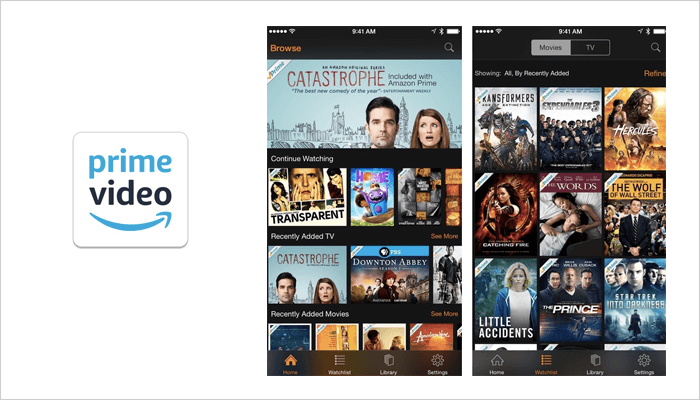 Amazon Prime Video is one of the most widely used online video-on-demand services that is developed, operated and also owned by Amazon itself. Over the past few years, the company has continued to grow despite the stiff competition in the market from other online movie streaming services. Today, Amazon has operations in more than 200 countries with a user base of millions of active users. In addition to all of this, it also made an entry into the field of sports by making an acquisition of all the rights to show parts of NFL games which was a deal worth 50 million dollars. From the very first day, YouTube is considered a direct Netflix Competitor and in fact, this video-sharing platform holds an advantage over it i.e. online streaming of live events. 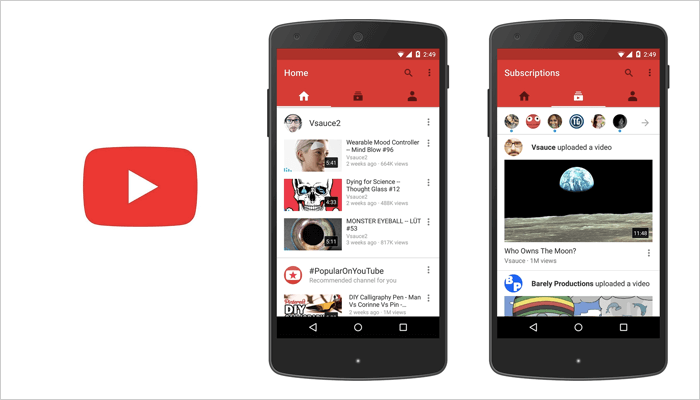 YouTube can be referred to as one of the largest video-sharing sites globally, which is used by hundreds or thousands of people to upload and share videos on a daily basis. Even though YouTube is ranked among the world's most visited websites, there are still some countries like Pakistan, China, and Syria where this platform is banned. If you want to keep yourself updated with the future of Netflix, what to watch on Netflix, best shows on Netflix, how much does Netflix cost in a month or anything else in that manner, then make sure to follow us. And if you are interested in reading more such articles with detailed and valuable insights then all you need to do is click on the ‘Subscribe’ button and never miss another trending update again. This infographic is to provide you with an overview so if you are interested in reading the complete Netflix guide then head over to MobileAppDaily now.